Whenever I can get out of the house early enough to stop in Starbucks on my way to work is a good day. I got my usual iced chai latte and because I didn't have cereal this morning (my staple), I was hungry and ordered a multi-grain bagel with shmear. "She was here first. [to me] You have the same order, right?" The lady paused for a moment and then, defeated, handed the brown bag over to me. Aaron kinda made my day. what i'm wearing today. clearly, i'm in love with my zara jacket. and why shouldn't i be, really? Yaii for People like Aaron!! So bunny got his bagel on time! Cute Jacket.. too weather this weather is all funky rain one minute sun the next! Cute outfit! It was raining here and then super warm twenty minutes later! Love the curls girl! 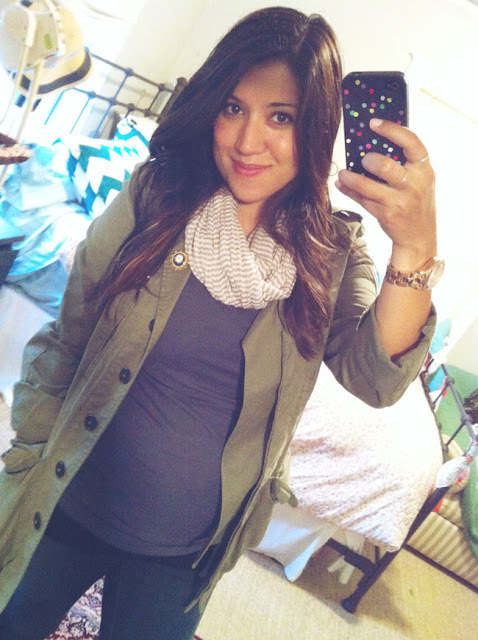 You're such a stylish mama-to-be! How could Aaron not be nice to such a beautiful Momma to be! Heart you! Vic, I think you need this. Meg! I looked too late. It's sold out!! But you are so right, i NEED that top. dangit!